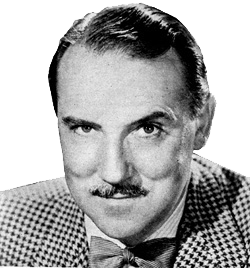 Although The Fibber McGee and Molly Show was considered his first big break, Gale Gordon is best remembered for his beloved roles after he left the program. Gordon continued to have an extensive radio career during the golden age of radio. He was first actor to portray Flash Gordon on the radio in the 1935 serial The Amazing Interplanetary Adventures of Flash Gordon. In 1939 he appeared as Molly's former beau Otis Cadwallader, and returned to the show for several bit parts. Don Quin created the role of Mayor LaTrivia especially for Gordon. LaTrivia was intended as a light hearted send up of New York Mayor Fiorello LaGuardia. Although kind and wise, LaTrivia was often reduced to sputtering bluster at the hands of our hero Fibber, much to the delight of audiences. This is in marked contrast to the treatment the character received during the War, when Gordon and his character left to join the service. Following the death of LaGuardia, LaTrivia was left off the show for a year. Gordon stayed on as Foggy Williams, the local weatherman and easy foil for Fibber, who would often borrow his tools and blame Foggy for the weather. Gordon would go on to success as Mister Wilson on Dennis the Menace and in the 1960's as a foil for Lucille Ball in I Love Lucy and Here's Lucy.